Saved! This sounds just great. BTW, I just had arctic Char for the first time and really enjoyed it. Love the opening about food bloggers. I guess we are a bit strange. I agree, arctic char is awesome. My favorite way to cook it is to sear it skin side down in a cast iron skillet. It turns crispy and just Mmmm good. try adding tomatoes, garlic and to it onions to gave it an asian kick..I'm sure it will taste good..
Yum... Cooked fish... (as much as I love raw sushi, I'm not allowed right now, and I'm too paranoid to disobey my doc.) And this recipe looks amazing. Can't wait to try it out. However, could you tell me what you served it on? Are those lentils? What kind? Any special preparation? This looks delicious, your post is so funny! 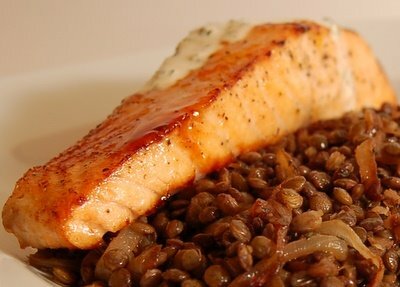 Are those lentils? What a great combo. So great. I'm happy that post of mine could help. After all the straining of needing to be great at this, I realized I could just write some stores. Or, a recipe. Thanks for being part of the gang of unusual people who take photographs of food. And that salmon looks amazing! Thanks for stopping by. I love your new posts. I don't know how you manage to write so much high quality material. Wow--the Dijon mustard sauce sounds amazing. I am also very intrigued by your use of leeks and fennel, two of my favorites. I think your writing is consistently of high quality, not to mention your food. I also have more ideas than time to write, but I like to think we are choosing quality over mere quantity! I always get something out of your blog.